The Middle Eastern desert has been among the regions worst hit by desertification and drought brought on by climate changes ever since the Dark Ages Cold Period (300-700). Though the volume of authentic geological data is far from sufficient to facilitate a reconstruction of the climatic history of the Middle East, available historical data combined with the examination of basic terminologies suggest a possible impact of climatic stress on the early formation of Islam in the Arabian Peninsula of the 7th century. Also, authentic historical records of the Umayyad, Abbasid and Mamluk eras suggest a possible correlation between climatic challenges and the occasional rise and decline of religious tolerance in Eastern Arab regions. The idea of climate having an impact on societies is not new in the Muslim aspect. Amongst many others, medieval poet al-Jahiz (781-869) and the great Andalusian historiographer Ibn Khaldun (1332-1406) preceded Western thinkers by many centuries in elaborating the idea of climatic determinism, even if they took the idea to the extremes. While not subscribing to climatic determinism ourselves, it should not be ruled out that responding to direct and indirect challenges posed by a harsh climate could have been one of the many driving forces shaping Muslim history and occasionally, even the inspiration for some of the doctrines of Islam both in the past and in the present. Early references to harsh climate of the Middle East date back to the very beginning of Islamic history that started at the end of the Dark Ages Cold Period and the rise in temperature on the Arabian Peninsula. Pre-Islamic Arabia was mainly inhabited by nomadic and semi-nomadic Arab tribes largely affected by arid climate. In the struggle for essential resources such as water and grass, membership in a tribe was important for individual survival and thus tribal loyalty (asabiyya in Arabic) formed the very core of identity and also promulgated a kind of moral code that required unconditional loyalty to one's own group. Those who became outcasts of their tribes either faced death or were forced to seek protection among other tribes. The main values and the principal source of pride among nomadic Bedouins have always been hospitality, generosity, courage, honor and self-respect. The values both enabled survival in a desert environment and offered decent treatment to outsiders of peaceful intentions. Although Islam was born in Mecca, it can hardly be defined as an exclusively urban religion. Lying in an arid environment of the Arabian Peninsula, Mecca was not self-supplying and its development was thus closely tied to the surrounding areas. According to a legend, the Well of Zemzem - the essential water source of the city - was a miraculously generated source of water by God for Hagar, wife of the Prophet Abraham, when she was left in the desert with her son Ishmael. Three main female goddesses were revered in pre-Islamic Mecca: Manat (goddess of fate), Allat (goddess of the sky) and 'Uzzat (the equivalent of Venus). All three were considered to be daughters of Allah, the central deity of local cults. Prophet Muhammad forbade the worship of all deities but Allah. It is instructive to recall that Allah was the god of the sky and the giver of rain in the beliefs of the Meccans. 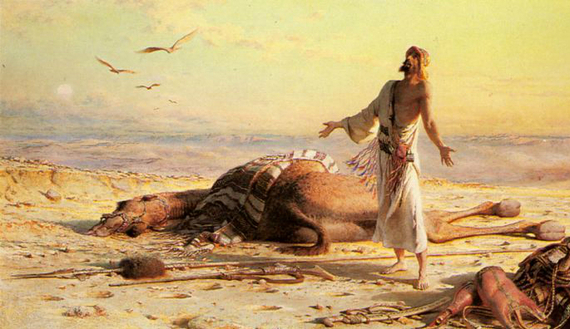 For the nomadic and semi-nomadic Arabs, the concept of al-Dahr, blending the concept of "time" and "fate" was still important part of the mental construction, most probably, because the desert calls for obedience and perseverance in order to survive. The acceptance of Islam did not conflict with such mental constitution at all: the word "Islam" itself suggests the idea of submission, the only difference being that obedience was henceforth to be not to the laws of harsh nature, but to God alone. In 615, two years after Muhammad began to preach Islam publicly in Mecca, many of his followers became outcasts of their tribes and were exiled to the arid mountains, where they suffered from the harsh climate and the potential animosity of the other tribes. Therefore, after his hijra to Medina in 622, Muhammad created a new "tribe", the Muslim nation (Umma) bonded not by blood, but belief, as the Constitution of Medina laid down a new asabiyya based on religion. The tribal traditions were partly transferred to the religious community, and it became a basic duty for members of the Umma to defend each other against outside attacks. However, a parallel could be drawn between attempts to integrate Christians and Jews into the Umma and the pre-Islamic tradition of protecting peaceful strangers. Ever since, Islamic order has been based on sharia, an archaic Arabic word, meaning "pathway to be followed", but also "path to the water hole", suggesting that in a desert environment, the path to water was a metaphor for the path to life. One can conclude, that a number of pre-Islamic values and social constructions, partly developed as a response to harsh climate, found their way to the basic concepts of Islam. The possible effect of climate could also be proven by examining the various passages in the Quran on the contrast between Hell and Paradise, accompanied by warnings that those who disobey Allah's laws will be consumed by the unbearably hot fires of Jahannam, while those who are obedient will have access to the Garden of Eden "beneath which rivers flow", again a possible reflection to the heat and drought of Arabia. Another eloquent reflection of the hardships caused by an oppressive environment is that green, the most welcome color for the people of the desert, became the color of Islam. The Islamic conquest of the Middle East dates to the onset of the Medieval Warm Period and can therefore be indirectly connected to warming because the nomadic Arab tribes who had converted to Islam were forced to migrate northward to flee the droughts devastating their lands. Even earlier, in 536, the pasturelands of Persia were scorched by drought that pushed about 15,000 Arabs into Byzantine territory. The presence of ethnic Arabs in Syria played a crucial role in the Muslim conquest of the northerly regions of Syria in the 7th century. In 661, the Islamic capital was moved from Medina to Damascus by Muawiya, the founder of the Umayyad dynasty. The Umayyads, a wealthy family from Mecca, built their castles outside the Syrian towns. As sons of the Arabian deserts, the rulers could have been enchanted by the favourable climate of Syria and their castles were surrounded with lush green gardens similar to those promised in the Quran and prophetic Hadiths. Very soon, the Umayyad nobles became addicted to a life of luxury and creature comforts, and they were seen as being decadent by the people of the desert and those on the frontier. Despite the favourable environment, the traditional Arabic way of thought still maintained its grip during the Umayyad period. Without neglecting its role in bolstering the divine legitimacy of the rulers, the fact that supporters of the Caliphate in polemic discourses were advocates of predestination (gabariyya), while those supporting the concept of a free will (qadariyya) were against them, can be possibly seen as a heritage of the Arabian deserts. The Medieval Warm Period is generally dated to between 950-1250, a period that roughly coincides with the Abbasid era between 750 and 1257, often referred to as the Islamic Golden Age. After the fall of the Umayyads, the Islamic capital was moved to Baghdad. Although the Abbasids claimed to be purifiers of Islam, the spirit of the age was affected by the convenient Mesopotamian climate as much as it was the harsh Arabian desert. The land of the two rivers had been the setting of many early cultures from the Early Holocene onward. Under the climatic conditions of the 8th century, Baghdad and its broader area was ideal for agricultural production, leading to population growth and prosperity. However, signs of rising temperatures and a slight decrease of water compared to previous centuries were already recorded. Although the Babylonian Talmud records rice as the staple crop among the Jewish communities of ancient Mesopotamia, grains with a high drought tolerance such as barley and durum wheat were the principal cereals dominating the diet in the Abbasid era. The Abbasids built an empire stretching from Spain to Afghanistan, enabling the flow of goods and the spread of knowledge between the Eastern and Western Mediterranean in a previously unknown manner. The economic prosperity based on a flourishing agriculture made the Muslim lands a safe haven for many minorities. Some Jewish communities of Europe were from the 9th century onward often singled out as scapegoats and blamed for poor crops and famines, leading to their expulsion, often as scapegoats for poor harvests and plaques. In contrast, Jewish scholars and even the minority Christians were not only held in high esteem in the Muslim Empire, but were often appointed to posts of great responsibility and were promoted to high-ranking positions in government. The fifth Abbasid ruler, the legendary Harun al-Rashid (786-809), was famous for not considering to which ethnic group or faith a member of his bureaucracy belonged, but only his personal capabilities and excellence. Religious tolerance dominated relations between common folk as well, in part because the more-or-less regular recurrence of Easter, Christmas and other Christian holy days regulated by the solar calendar were more suited to accurately marking the agricultural seasons than the lunar-based Muslim holidays. Muslims often joined their fellow Christians in their celebrations. Shared rituals thus strengthened cohesion between groups professing different beliefs. The overall prosperity and abundance of essential resources could be viewed as a potential reason for the flourishing of mathematics, astronomy, philosophy and other sciences. Many major Greek, Persian, Syriac and Sanskrit writings were translated by Arab scholars, and manuscripts from all over the world were collected at the courts. Aristotelian logic was adapted to Islam, leading to the decline of orthodox faith and the rise of skepticism. Dominant Muslim schools such as al-Mu'tazila were influenced by Greek philosophy and began to distance themselves from the traditional soul of Arabia. Despite the general prosperity, when the climate deteriorated in various parts of the Empire, receptivity to more radical religious slogans rose. The Arabisation of the Maghreb region in the 11th century was a partial consequence of climate changes. A drought followed by famine hit Arabia that pushed the Banu Hilal, a confederation of nomadic Bedouins, to migrate with their families and cattle herds to Upper Egypt. In the 11th century, during the Medieval Warm Period, Egypt was ravaged by a similar drought leading to environmental degradation. The Fatimid ruler strove to expel the nomads. At the same time, tensions grew between the Caliph and the Zirids of Maghreb who had abandoned Shiism and declared their independence from the Fatimids. 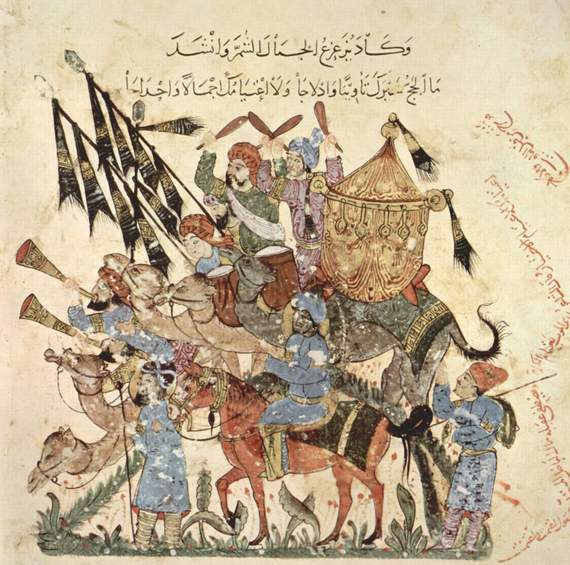 Hoping to kill two birds with one stone, the Fatimid ruler claimed a religious legitimation of their ambitions by declaring Jihad, and sent the Banu Hilal to war against the Zirids in defence what they claimed to be the true faith. By 1057, the Banu Hilal had defeated the Zirids and transplanted nomadism to previously agricultural areas. The lands devastated by Banu Hilal became a dry desert where crop cultivation could not be practice until recently. The decline of Muslim Empire is usually attributed to foreign invasions. Between 1097 and 1291, European Crusaders fought in the Levant, Cordoba fell to the Spanish Christians in 1236 and the Mongols sacked Baghdad in 1256 (or 1258). Trade routes became insecure and communities turned inward and became self-supplying in feudal isolation. Science and philosophy survived only for a while in scattered pockets. The Muslim lands never truly recovered from the defeat that could be attributed to political fragmentation on the one hand and the end of the climatic optimum on the other. The Medieval Warm Period was followed by the Little Ice Age, spanning the period from about 1350 to 1850. In Europe, historians such as Emmanuel le Roy Ladurie and Wolfgang Behringen regard this period as an age of clerical tyranny caused by climate deterioration that made human populations turn to the divine. In the heart of the Muslim world, the Little Ice Age can be largely equated with the Mamluk era. The Mamluk Dynasties ruled Egypt from 1250 to 1517, and then as a vassal of the Ottoman Empire until 1811. In his book, The Climate of Rebellion in the Early Modern Ottoman Empire, Sam White explains how the cooling climate played a key role in the spiritual and human drama of the Ottoman lands. Mamluk Egypt was more negatively affected because, being a relatively small province, it lacked the necessary resources to compensate for bad harvests by acquiring goods from other parts of the realm. It could hardly be a coincidence, that by the end of the Medieval Warm Period, the age of Islamic tolerance, at least in the Middle East, had come to an end. Ibn Taymiyya (661-728/1263-1328) was the perhaps most illustrious religious scholar of the Mamluk period. Taymiyya, regarded by many as the first Salafi, headed a Sunni Muslim purification movement and declared that Muslims who did not profess to his approach of pure Islam were regarded as infidels. The teachings of Ibn Taymiyya were embraced by the Mamluks because he declared Jihad ergo offered religious legitimacy for the wars against the Muslim Mongol invaders and various minorities such as the Druze and Nusayris opposing the Mamluk rule. While some religious trends were driven by shifts in the status quo of power, others were a direct consequence of climate deterioration. Iraq's agriculture depended on artificial irrigation to a large extent, which called for an efficient administration and public order. After the Mongols established themselves in Iran, Iraq became a poorly administered border province, one consequence being that agriculture declined. In the meantime, the Muslim lands in Egypt were hit by harsh climate. Historic records prove that repeated weather anomalies occurred in Egypt between 1250 and 1500. Rains, hail, floods, heat, drought and wind hit agricultural production, undermining the source of livelihood in rural areas and causing food shortages and higher prices in urban areas. Various climate-related events, often mentioned in the Mamluk chronicles, are definitely a sign of the Little Ice Age and its cold weather. In the year 1374, many people died from cold and starvation. In 1423, there was a siege of rain and cold. Fine mists fell on the crops and many animals perished in the countryside. During the famine of 1293 and 1295, even cannibalism was practiced among the families in Egypt. Climatic stress gave rise to various forms of occultism, eschatological fantasies and even heretical or separatist movements. The worship of self-declared prophets, messiahs and saints became widespread. The number of communal prayer services for deliverance from disasters grew. Gatherings were held to pray for rain, adequate floods from the Nile, and for deliverance from epidemics. Even Ibn Taymiyya supported prayers for rain as being legitimate according to early Islamic traditions. The end of the Little Ice Age marked a new beginning for Europe. As the climate turned warmer and more suitable for agricultural and industrial production, the Reformation movement emerged which set itself the goal of reducing the unnecessary power of the Church. Individualism was on the rise as the Protestant individual separated himself from the "natural ties" of the community and obedience to divine powers. The climate warming that helped Europe to break with the dark Middle Ages and build a flourishing economy had an exactly opposite impact on the Muslim lands. Warming resulted in water shortages, while droughts meant diminishing harvests. As essential resources remained limited, existing social structures, defined by strong bonds on the familiar, tribal and religious level remained necessary for individual success. At the same time, capacity for extra activities and innovations remained low. When Napoleon arrived to Egypt in 1798, he found Muslim armies equipped with medieval weapons and a traditional society of strong religious identities.